Here is Car Art’s largest gallery: 150 artworks by one of the most prolific and award-winning artists in automotive history. Ken Eberts’ work is unique in portraying a greater history of cars than any other artist — covering every decade all the way back to 1897 — as well as more marques; over 40. He was chosen by Ford Motor Co. to commemorate their centennial in 2003, an honor last given to Norman Rockwell for their 50th anniversary. In 2005, Eberts received a 'Car Oscar' — Meguiar's Treasure of the Hobby Award for his lifetime achievements — the first time it had ever been awarded to an artist. Through his artwork he communicates the history, excitement, aesthetics, nostalgia and his love of automobiles, in a way that can be understood and appreciated by car and art enthusiasts alike. His paintings are often recognizable for a wealth of architectural details in their settings. A graduate of New York's High School of Music and Art and Los Angeles' Art Center College of Design, Eberts began his career as a car designer for Ford Motor Company. 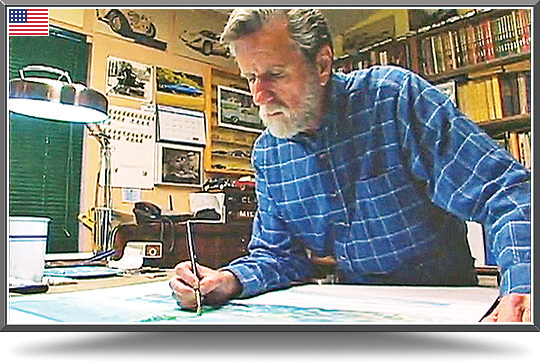 In 1968 he turned his attention from design to art, and has been a full time automotive fine artist ever since. Over 1,200 of his original paintings are in public and private collections worldwide. Prints and posters are displayed in thousands of enthusiasts' homes and offices. His paintings have also been reproduced as magazine and book covers, Christmas cards and posters to commemorate automotive events. Every August for over 20 years, the AFAS Premiere Art Exhibition has been a feature of the Pebble Beach Concours d'Elegance. A milestone was reached in 2008 when, for the very first time, a museum devoted solely to fine art hosted a major exhibit of automotive art: Zero to 60: Art of the Automobile ran for three months at The Grace Museum in Abilene, Texas. “Automotive fine art is a growing genre that is catching fire with automotive purists as well as art collectors. Regardless of backgrounds or preferences, the automobile is a passionate subject that resonates with all of us,” says Eberts. Ken Eberts has achieved wide recognition for his work. It has been exhibited throughout the United States — including more than 25 one-man shows — earning awards from the City of Los Angeles, American Artist Magazine, the City of Beverly Hills, the Auburn Cord Duesenberg Museum, and many others. He has been an exhibitor in the National Watercolor Society and his paintings have also been part of their National Touring Exhibition. In 1990 and 1992 he received the prestigious Peter Helck Award 'Best of Show' at the AFAS Exhibition at the Pebble Beach Concours d'Elegance. In 1994 and 1995 he received the Richard Teague Award, presented to the artist whose body of work best exemplifies the spirit of the automobile, at the Meadow Brook Hall Concours d'Elegance in Rochester, Michigan. Commission Ken to create a unique painting for you!